Ghosts ‘n Goblins, on the other hand, is just difficult in the sense that it is very patience trying and unfun. Before I hear the parade of apologists proclaiming “git gud” I should make it clear that I did beat this game twice, and yes I am counting it as twice regardless of that stunt they pulled the first time. Ghosts ‘n Goblins may be beatable, but it isn’t exactly an enjoyable game to play. Most players will be having far more frustration than fun and beating it serves no purpose other than bragging rights. The story of Ghosts ‘n Goblins is an excuse plot about a knight named Arthur needing to rescue the princess when she was captured by demons. This requires Arthur to venture into ghoulish landscapes in order to rescue her. I will say right here that the presentation in Ghosts n Goblins is done very well. Each level has a unique appearance to it and has a different feeling. The graphics look decent by the standards of the era and the music is ominous yet also catchy. The sound effects are decent but not really as great as they could have been. Da, na na na na na na nana! Perhaps one of the most iconic features of the game is how Arthur taking damage causes him to lose his armor and be stripped down to his underwear. This demonstrates that the game does not take itself too seriously, yet at the same time it is seriously brave to charge into unknown demonic territory in nothing but your underwear. Another notable feature of the presentation is how it shows you the map of the entire stage layout so you see how far you still have to go. This always gives off the feeling of intimidation at the beginning but gives a confidence boost of being almost there once you are close to the end. Lastly on the subject of positives, the game does still cut the player a break in a few area. First of all, there are infinite continues in every version of the game. Secondly, you never need to start a stage from the beginning after you reach a checkpoint, so it does make things a bit more manageable. However, it is now time to get to what makes this game so tedious. In concept the objective of Ghosts ‘n Goblins seems simple; go right and get to the end of the level while defeating the enemies in the way. However there are multiple reasons this game just becomes outright unbearable, most of which do not have anything to do with the level design itself. The main reason for this would have to be the jumping controls. Arthur does not have the ability to control himself in the air which means you will often see him flying into enemies head on because you jumped before they decided to make an unpredictable movement. Another major issue is the fact that Arthur has the tendency to stick to the ground for a second whenever he crouches, which ends up preventing him from moving in cases that require quick movement and reaction time. This ends up being even worse whenever you are on a ladder because you can’t use your weapon while on or jump off one. This will end up leading to a lot of cheap deaths. Furthermore the axe and torch powerups are made useless due to the fact that they are thrown at an arc which makes it harder for them to hit enemies with. Even worse is that you can only have two of them on screen at a time so you will often be left defenseless in critical situations. This ends up going from minor nuisance to critical flaw in this game when one considers that, if you collect one of these, it automatically replaces your current weapon even when you die and start over. 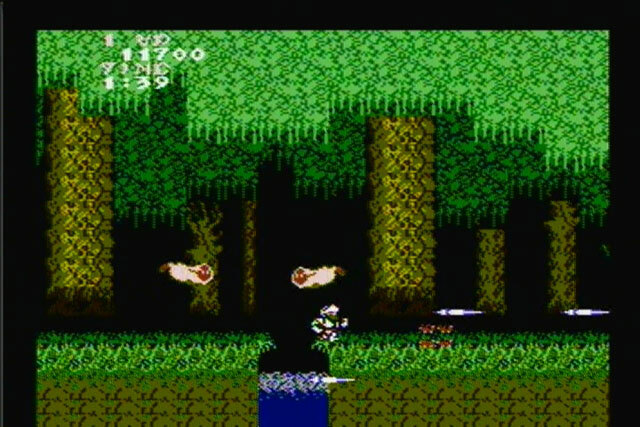 Powerups also NEVER despawn, meaning that if one if dropped in front of a ladder or on a platformer you need, the only choice is to be stuck with it, or commit hare-kiri and try again. Also the game requires you to have a certain weapon equipped in order to fight the final boss and if you don’t have it you need to replay level five and six. If those still were not enough you also have a time limit on each stage. Such a thing should not exist in a game based around methodical planning and carefulness. This is a contradiction of game design and only makes the game unnecessarily difficult, which means that it fits right in with Ghosts ‘n Goblins. This ending screen belongs in a museum. The depressing thing is that there is not much wrong with the level designs themselves. If one were to watch a video playthrough of them they wouldn’t look hard. However, due to all of the above issues, the difficulty of Ghosts ‘n Goblins just goes through the roof and beyond what most gamers would be able to tolerate. Ghosts ‘n Goblins had some interesting ideas in it and was good in concept. Unfortunately, the end result is way too tedious and frustrating to be any fun. One could say there is some value in the feeling of satisfaction that comes from beating it, but the same can be applied to any difficult task. Overall, I cannot recommend Ghosts ‘n Goblins as a game to play for fun. This review was originally posted to GameFAQs on March 23rd of 2016 and has since been re-edited with enhanced presentation.